I came up with this prompt while teaching high school, but it works with younger kids, too. It gives the students a choice of what to comment on, and allows them to use their own voice to tell it like it feels. You may learn a lot about music, sports, and their dog; but sometimes you will also learn about very serious topics like family crisis or illness. And at times the school can help the families. But you will know the students better, especially if you actually read the essays and comment on them. The kids feel very validated, and more willing to write the remainder of the year no matter what the topic. 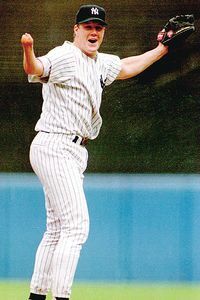 Jim Abbott of the Yankees, pitching a no-hitter. I especially enjoyed when the students shared their dreams for their future. You would be amazed how many major league baseball players (of the future) were in my seventh grade classes. Far be it from me to say otherwise. Who knows, anyway? If Jim Abbott, who had only one hand due to a birth defect, became a major league pitcher, shouldn't I be like his grown-ups and be filled with encouragement for kids' dreams?